Recently we told about the problem that exists worldwide with the large differences of between the same models of Gigabyte motherboards, that while per box say they are the same model, vary more than normal as revised. Seeing different revisions is normal in almost all brands, but the problem here is that the differences between one revision and another is so big that it would be ideal that the company put another code for them, but it doesn’t really happen that way. The new addition to the catalog of Gigabyte motherboards fully incorporates in the high-end motherboards, those with Intel X99 chipset for the new Haswell-E processors with LGA-2011 socket. Unlike most motherboards for this platform, the X99M-Gaming 5 arrives with an attractive Micro-ATX format, more compact than ATX and even EATX, we’ve seen in other models. The enormous LGA 211 socket surrounds itself with 4 DDR4 memory slots. Besides, in despite of its smaller size, this board offers space to put two graphic cards in both PCIe 3.0 X16 ports, also not lacking the recently popularized M.2 and SATA-Express ports. It also incorporates Realtek ALC1150 sound card with 115dB SNR, amplifier and AMP-UP technology with interchangeable operational amplifiers. The motherboard integrates high quality and high resistance components, especially at the energy delivery system area with PWM digital controllers. Network connectivity comes from the hand of a Killer E2200 card players focused on packet prioritization to minimize delays or lags. The new GIGABYTE GA-X99-GAMING G1 WIFI presents itself as the top of the line of its company’s catalog of motherboards based on the new Intel X99 chipset and built to realize the maximum potential of the powerful Intel Haswell-E processors. As a member of the G series, this is a first-rate product with a clear orientation to gaming; we’ve tested it out, and here are our impressions. Like any other motherboard based on X99, this model offers support for the 2011-v3 socket, compatible with all Intel microprocessors from the Core i7-58xx and Core i7-59xx series, unveiled a few months ago. Among several other virtues, it has DDR4 memory support (eight slots), integration of a WiFi/BT module in the PCB and SATA M2 support (a shame it’s not Ultra, but is only 10 Gbps). This Gigabyte motherboard is a total prodigy. The tip of the spear is the new G1 Line for “gamers”. In fact, I can directly point out the only issue, not defect, that I encountered, which is the lack of an M.2 integrated onto the board itself. From this point on, we are ready to analyze the rest of it wide variety of features. It does not stop being a Z97 board, but Gigabyte has combined a great motherboard, a new BIOS design, good component organization, and with no doubt an elevated potential to build a system with high specification, either for gaming itself, overclocking or both. We have mentioned that this board continues to be a Z97 chipset. This indicates that it is built for this generations Core Intel Processors, including yesterday’s latest update, but it will also be compatible with future Core Processors, Fifth Generation, that will come from a very important reduction in the manufacturing process. Intel prepares factories top build these new CPUs to 14nm and these boards which support the Z97 and H97, will be compatible with these 2015 processors. The Gigabyte 9 Series is a new family of motherboards denominated this way because it includes the Intel 97 chipsets, both the high-end version Z97, and the more modest version, the H97. Within these two models, Gigabyte has distributed its catalogue in 4 different families: the gaming models, the Ultra Durable, the overclock array and the Black Edition, a fourth array that combines all. Altogether, we’re talking about an impressive catalogue with no less than 34 motherboards. Starting with the boards intended for players, we find the Gigabyte Gaming series, with 12 models intended for all those people who use their OC to play most of the time. It integrates technologies like AMP-UP Audio to get a clear, realistic sound and a 100% customizable by the user, or Killer LAN cards with network traffic prioritization for gaming. We’ll have all kinds of sizes, from ATX to Mini-ITX compact boards like the Z97N-Gaming 5. For the overclock lovers and those who love to get the best possible performance from their components, Gigabyte updates its Super Overclocking series, with models like the Z97X-SOC FORCE, with buttons dedicated to manually control the overclock from the board and high quality components to get the maximum stability in the CPU and memory power delivery. When the Nvidia GTX 750 Ti with Maxwell architecture was presented, most manufacturers rushed headlong to submit their own models with improved cooling systems and speeds. Gigabyte introduced its own model with a speed of 1033 MHz in normal mode and 1111 MHz in Turbo mode. However, it seems that the Maxwell architecture and high energy efficiency allows a higher speed without sacrificing stability, and since the dissipation system of the Gigabyte Windforce dual fan is able to dissipate much more W, the company has decided to launch a faster, new model. The new Gigabyte GTX 750 Ti has an increased working speed for the GPU, reaching 1215 MHz in the 640 CUDA cores, up to 1294 MHz in Boost mode. The memory remains unchanged from the previous version, keeping its 2 GB GDDR5 at 5400 MHz. 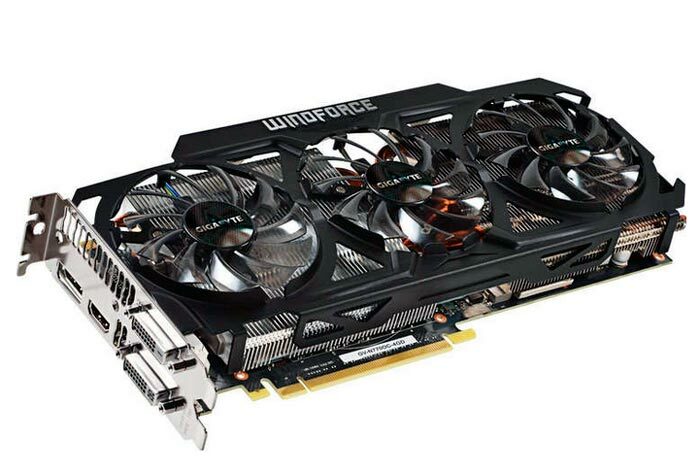 Windforce’ heatsink system included in this graphics card features three fans, designed to cool two blocks with five heat pipes each. This allows the card to function at lower temperatures, disipating over 450W, almost double than the GTX 770’s TDP (230W). Windforce dissipation system that includes this graph has 3 fans that cool two blocks of dissipation with 5 copper heatpipes each, this allows you to work at lower temperatures, getting dissipate up to 450W of power, an amount almost double that TDP a reference GTX 770 with 230W.